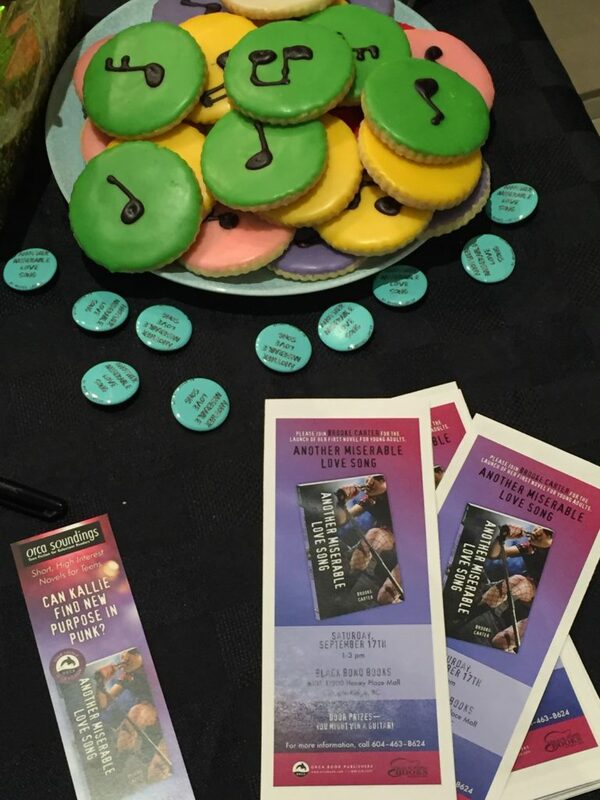 I loved my book launch! On Saturday Sept. 17 I held the book launch for Another Miserable Love Song at the Black Bond Books in Haney Place Mall. I was nervous. Would anyone come? Would we sell any books? Would I be able to speak or would my nerves get the better of me? You know what? I had a fantastic time! It helped a lot that the folks at Black Bond Books are experts at hand-selling books, and they’d managed to convince several lovely readers to come to the launch. So not only was I able to sell more books and sign them, I was able to meet people WHO HAD ACTUALLY READ THE BOOK! I can’t tell you how amazing that was to have people walk up to me an talk to me about the book. It was particularly moving when a trans youth approached me to discuss the themes of the novel and it was very touching to find out that it had meant a great deal to them. The best part of the day (apart from the yummy sugar cookies supplied by The Haney Bakery) was when a group of local students came to the launch with their librarian. 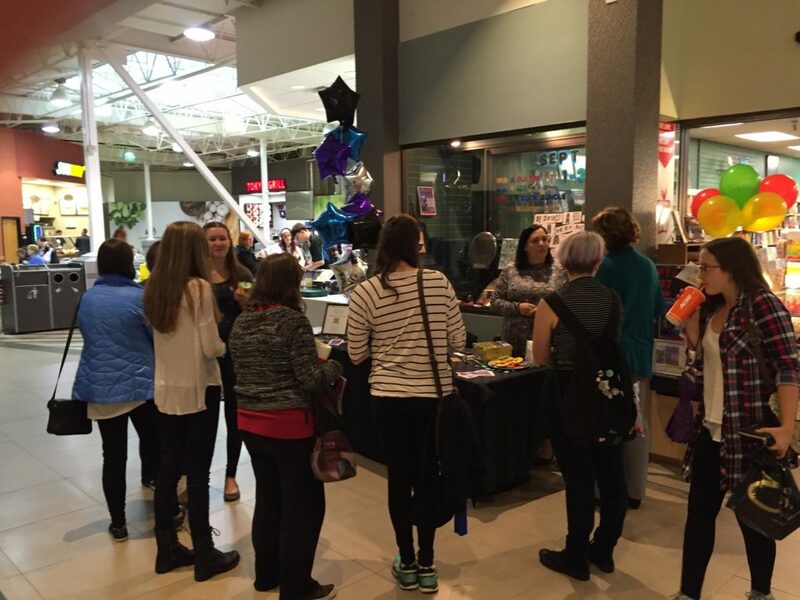 They all bought books, got them signed, and entered to win prizes from the raffle. 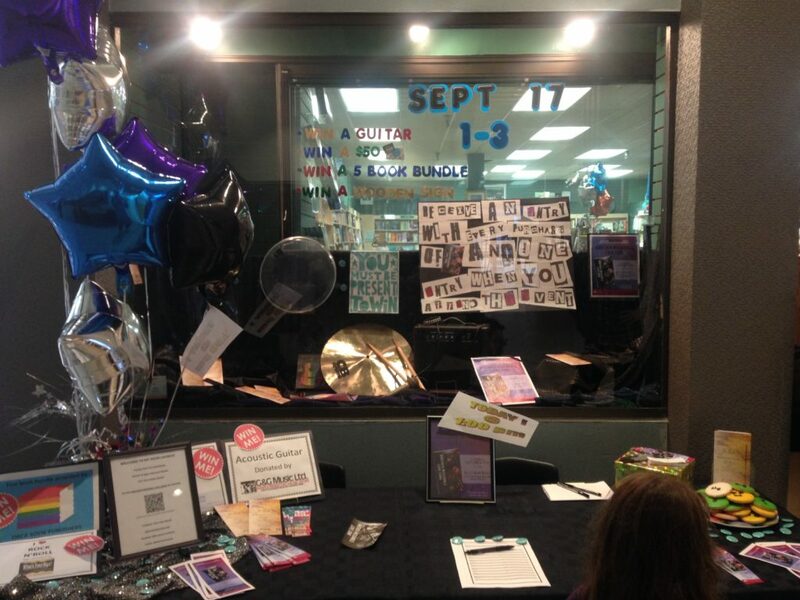 I was so pleased at the end of the launch when the teens won the guitar (supplied by G&G Music), the Pride-themed book bundle (supplied by Orca Book Publishers), and the I Love Rock & Roll sign (supplied by What’s Your Sign? Canada). Another lucky reader won a $50 gift card (supplied by Carter Litigation) and promptly used it to buy a copy of fellow Orca author Robin Stevenson‘s non-fiction book, PRIDE. It was an amazing day made possible by friends, family, readers, supporters, local media, and of course the great folks at Black Bond. I can’t wait until LEARNING SEVENTEEN comes out in 2018 — I hope they’ll have me back for another launch! My book signing table and display!